Helol The following viewpointy article appeared in the Charlotte Observer on 9/23/17 and was written by Pamela Jefsen and Liz Clasen-Kelly. As people who work on the front lines of homelessness, we see the human toll everyday: Working people living in their cars and sleeping in our emergency shelters. We see individuals struggling with mental and physical health disabilities, unable to work, but unable to provide housing through their disability income. The mismatch between economic realities and our housing market creates instability in families and in our community. The City recognized this instability. 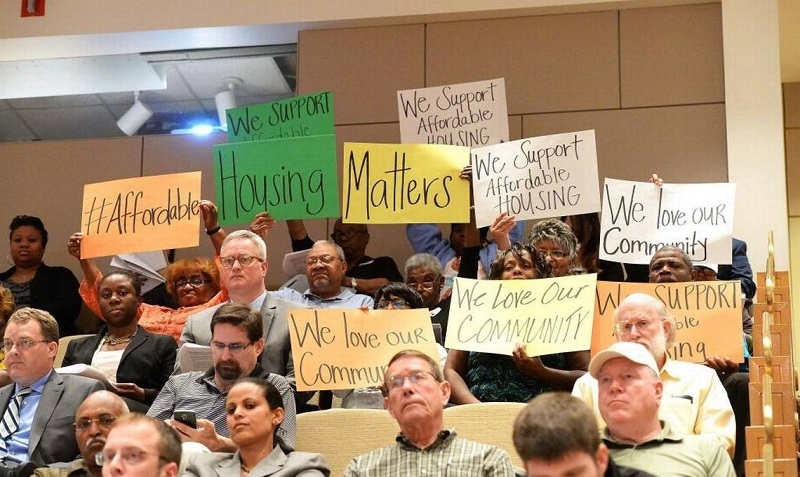 Last fall, when City Council signed what has become known as “the community letter” in response to the anger that erupted following the shooting of Keith Lamont Scott, a primary goal laid out was the creation of 5,000 more affordable housing units. Members of City Council were drawing a line between the frustration of those on the streets and the lack of affordable housing opportunities. So, we are disappointed that while the City is on the precipice of making progress towards the goal of 5,000 units, they are not targeting the greatest housing need. For more than a decade, tax dollars have paid consultants to bring our officials data on affordable housing. Consistently, that data has shown that when household incomes and rents in our city are compared, the housing gap exists almost exclusively for those at 30 percent of the median income (About $15,000 for individuals or $21,000 for a family of four). These are individuals who work at your local dollar store, who serve your meal at your favorite lunch spot, who care for your infants and elderly parents. To be “affordable,” their rents would need to be around $350-$400 and quite simply, our market does not produce housing options at this level. Those earning less than $9/hour are forced to pay higher rents, crowding the marketplace for those with more moderate incomes. Despite the data that shows the housing gap for the poorest 15 percent of our community, the City is getting ready to invest nearly $21 million to create 729 units. Only 3 percent of the units will target extremely low-income households. Their reason? It’s really expensive. There is no denying it takes more money to create housing at lower rents, but we ask our City what costs the community is paying by not allowing the working poor and disabled the ability to afford decent housing? Based on the community letter, City Council believes last fall’s unrest was one of those costs. We know that there are over 3,000 students homeless or precariously housed within our school system and that they are less likely to be proficient at grade level in reading, a predictor of later life outcomes. 1. Find an alternate source of funding that would provide a rent subsidy voucher for 25 percent of the 729 units being developed. This rent subsidy would allow those with extremely low incomes to afford one of these newly constructed units. To meet this goal, combined with a State subsidy program already in place, the cost would be around $500,000 year. 2. Going forward, Housing Trust Fund dollars should only go to projects that have at least 25 percent of the units targeted to those at extremely low incomes. Of course, developers have to be able to finance their projects. Right now, the City’s investment is typically just 1/6 of the project. The City’s investment will likely need to increase, if we are going to reach those with extremely low income in our community. 3. Increase the Housing Trust Fund. Bond capacity is at $30 million, so that is a great place to start the conversation. With increased funding, it will be easier for the City to lower their leverage to serve lower incomes. To solve the affordable housing problem, our City cannot afford to do what is easiest. We must grapple with how to provide housing where the need is the greatest. Clasen-Kelly is Homeless Services Network Advocacy Co-Chair and Jefsen is the Homeless Services Network Chair.